During the summer and fall of 2006, U.S. Coast Guard planes flew over the North Pacific in search of illegal, unlicensed, and unregulated fishing boats. It was a tricky operation—in part because low clouds often block the pilots' view of anything floating on the ocean surface below. Actually, it was a satellite—CloudSat, an experimental NASA mission to study Earth’s clouds in an entirely new way. While ordinary weather satellites see only the tops of clouds, CloudSat’s radar penetrates clouds from top to bottom, measuring their vertical structure and extent. 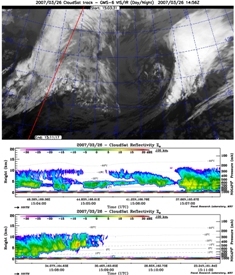 By tapping into CloudSat data processed at the Naval Research Laboratory (NRL) in Monterey, CA, Coast Guard pilots were better able to contend with low-lying clouds that might have otherwise hindered their search for illegal fishing activity. In the past, Coast Guard pilots would fly out over the ocean not knowing what visibility to expect. Now they can find out quickly. Data from research satellites usually takes days to weeks to process into a usable form, but NASA makes CloudSat's data publicly available on its QuickLook website and to users such as NRL in only a matter of hours—making the data useful for practical applications.